Agonizing wait and painful recovery are over. Michael MAZE is back. 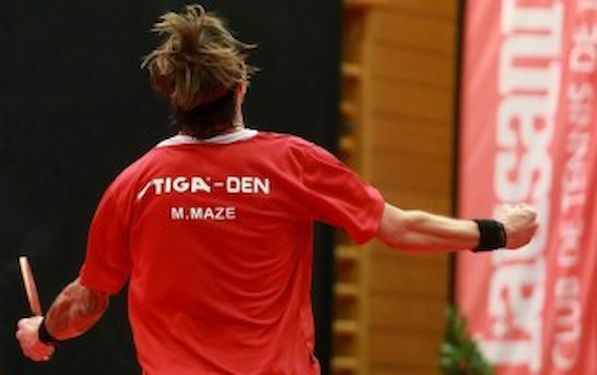 On his first tournament after brief appearance at the LIBEHERR European Championships in Austria last year, at the DHS 2014 Europe Cup, Michael MAZE reached at least the semifinal of the Men’s Singles Event. “It is so nice to play again. After 15 months finally I am back on track. I do not want to make any predictions, and I go one step at the time,” said MAZE. At the opening day MAZE beat Alexey SMIRNOV and lost five games duel against Marcos FREITAS. He stood the challenge of playing full distance match, recovered after defeat against Portugal’s player to secure the quarterfinal in the duel against Russia’s SMIRNOV.